Im sitting in the park opposite La Familia Sagrada listening to a guitarist plucking sweet gentle music. It has calmed my nerves. Yesterday, we wandered la Ramblas and the waterfront, being pushed to and fro through the crowded streets. The sound of honking car horns, motorbikes, cars and trucks flying past was jarring and unsettling. The ever present threat of pick pockets is there and everything is expensive. We found refuge in a cafe and ate some mini hamburgers and then scuttled back to our rooms to collapse. It is a culture shock. How do you do this Jen? 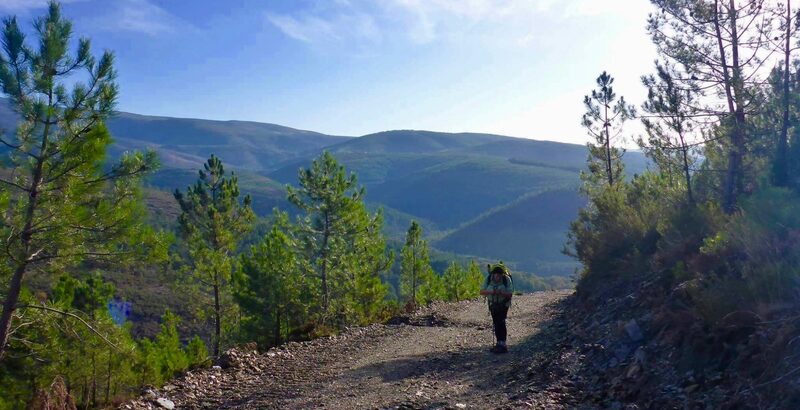 I can see why you are always on the Camino now. At the moment, I’m away from the hectic crowds of ugly Barcelona, for that is how I feel about it. There is nothing here that attracts me. It is a huge assault on my senses after being in peaceful atmospheric Galicia. I’m feeling really emotional again. I need to fill in the day until my evening flight but I’m dragging my feet and not enjoying my time here at all. Patti has gone into the Gaudí cathedral circus. I just couldn’t think of anything worse. It is ugly. The crowd is heaving like monstrous ocean waves circling the place. I’m so out of place here and I long to return to the beautiful forests and gentle rivers I have just left. The guitarist is playing Leonard Cohen’s Hallelujah. Spain makes me so emotional … I feel Spanish. I look back over my life and see that there have been so many things connecting me. My father’s ashtray was a scallop shell! My mother treasured her Spanish shawl (which I still own), she played flamenco guitar, she spoke Spanish, she came here on holidays several times as a child….and her father was a Druid. Both Patti and I are just going through the motions today. No funny antics. We are both feeling the same. We are both already counting the days till we can return. We walked back to the hotel, inhaling the pollution and feeling the weight of city life closing in, as the walls of stone surrounded us. It’s suffocating. Sirens ringing, horns blaring and people pushing and yelling. Nobody was smiling! The haven that was the hotel appeared like a mirage and its jaws gaped opened as we arrived. A staff member greeted us and we went to have a complimentary drink and some much needed sustenance in the form of a hamburger and a club sandwich, oh and of course a glass on wine. The peace that enveloped us was heavenly. I am now, after a teary goodbye to my beautiful friend Patti, at the airport. I’m waiting for my 10.00 pm flight to Dubai ( the first leg of the long trip home). I feel like I have lost not one limb, but two! Gosh the camino forms such deep friendships and I am so very grateful. How can I care so much for someone I have only known for 6 days?! I do though. And Gonzalo, well what can I say. It was my lucky day when I met him that’s for sure, and also Johnniewalker! See you on the flip side folks! Margaret. Love Barcelona in its own way. Been there several times. But I am better suited to the country than the cities. Safe travels home. I’ve never been to Barcelona but you write so well I fully understand how you feel. Really enjoyed your posts, save trip home. You’re connection with Patti was quite something, thanks for sharing all your thoughts etc. I wish I could post the short video I took today of the normal everyday sound and sight. If you could only post the smell tho. I can’t believe we have only know each other just 6 days!?!?! That is mind boggling after how close I feel to you. Thank you for so many beautiful and hilarious times. Thanks for taking care of me when I had that freakazoid accident. Meant to be I guess. Yes, I feel I’ve known you for years. I think it’s so funny how we bounce off each other and make each other laugh so much. I had the best time with you Patti. 💜 to be continued …. I love actually Barcelona having been there in 1992 and 2007. But how I struggled there when I visited at the end of my Camino in 2016. It was overwhelming and unpleasant. My camino partner’s husband had gotten us rooms at a Marriott using his points. He was apologetic that it was not in the center of town. Us – we were so grateful for the quiet neighborhood, far from the crowds! I am sorry it has assaulted you, but I understand. Peace, my friend. Marg, I felt exactly like that in Paris after being in the beautiful French countryside in July this year, where the birds were chirping and I’d been surrounded by beautiful nature and friendly people. Paris felt so jarring on my energy field. People were pushy, angry and unfriendly, the metro was crowded and screeched around corners, and there were military officers everywhere with machine guns. So I escaped to Versailles with a 2 day pass and spent hours wandering around the magnificent gardens and the Hamlet created by Marie Antionette so long ago. Nature is so very healing. Next PostNext If the Shoe Fits….